I was able to obtain this model from Airsplat, where it is currently available HERE, priced at $109. The gun was shipped out within 24 hours, and I received it a few days later, via UPS Ground, which is Airsplat's free shipping option for orders over $150. I always recommend checking out your retailers coupon/discount section, as most will have a deals like free shipping, saving you a few bucks on your order! The 1911 comes packaged in a plain cardboard box, with a white foam insert covered in black fabric. WE tends to line their boxes in fabric, to make for a better presentation. It's a small touch, but still a nice one! The gun comes as a pretty bare bones package, only including the pistol, a single magazine, and a fairly detailed manual. You will need to provide your own gas, BBs, and silicone lube to use the gun, but these are things that most airsofters will have anyways. Like all current WE pistols, the Desert Warrior is full metal, with the only plastic parts being the grips. It is a well balanced gun that fits well in your hands, and like all 1911s, has a fairly steep grip angle, which is how I personally prefer my pistols. The gun is finished in a matte tan finish, which has held up to my abuse so far without any scratches. One of the first things you notice on this pistol is the G10 style grip that has been installed from the factory. These grips are made of hard plastic, and provide plenty of grip, with one minor issue that I've come across. 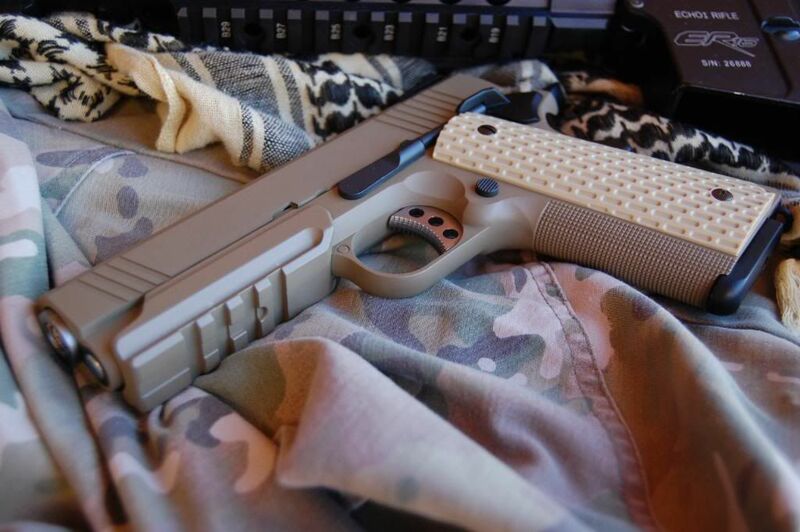 Most 1911 grips are beveled down at the bottom, to prevent a rough edge from hitting the bottom of your palm. On these, the grips come straight down, and the dimples almost form a slight serration, which can irritate your hands if you aren't using gloves. I remedied this by going over the bottom edge with some sandpaper to smooth and round out the bottom of the grip. The magwell is slightly beveled to aid in loading your magazine. The front and back strap of the grip have pretty aggressive checkering, which further add to the high friction grip. The back strap also has a grip safety with extended beavertail, which is very easy to activate when firing the gun. The controls are located on the frame, and consist of the trigger, magazine release, slide lock, and ambidextrous safety levers. The controls are all black in color, with the exception of the trigger, which is silver. The ambi safety only clicks into safe when the gun is cocked, like all 1911s. The slide lock doubles as the disassembly lever, which I will explain in detail in the internals section. Like almost all 1911s, the single action trigger pull is light and smooth; the stuff dreams are made of. Being a single action pistol, the hammer must be cocked back before the gun will fire. Now, when you rack the slide, the hammer will be cocked initially, and the blowback action will recock the hammer with every shot. You can manually lower the hammer to half cocked, and to fire, you would need to pull it back fully, then pull the trigger. The front of the frame has a removable metal 20mm rail, allowing you to mount up lights, lasers, grips, or whatever else you can fit on it. It is removable using the two internally mounted phillips head screws, accessible after removing the slide. I would recommend adding some loctite to these screws to prevent the recoil from loosening them on their own. The slide is metal, and features front and rear serrations to aid in cocking the gun. This slide is designed to use a bushingless barrel design, so disassembly is a little different compared to other 1911s, which I will discuss in the internal section of the review. The outer barrel is a flared design, to accommodate the lack of a barrel bushing. It is 4.3" in length, indicating this as a 4.3 model. The orange tip is a plastic plug forced into the muzzle, which I removed for this review. Threaded barrels are available at various retailers, if you wish to mount a can or tracer unit. The iron sights are adjustable for windage, but not elevation. The rear sight is detachable, and is adjusted by loosening the flat head screw, and sliding it side to side. The front sight is molded into the slide, and has a spot for a dot, which is not painted. 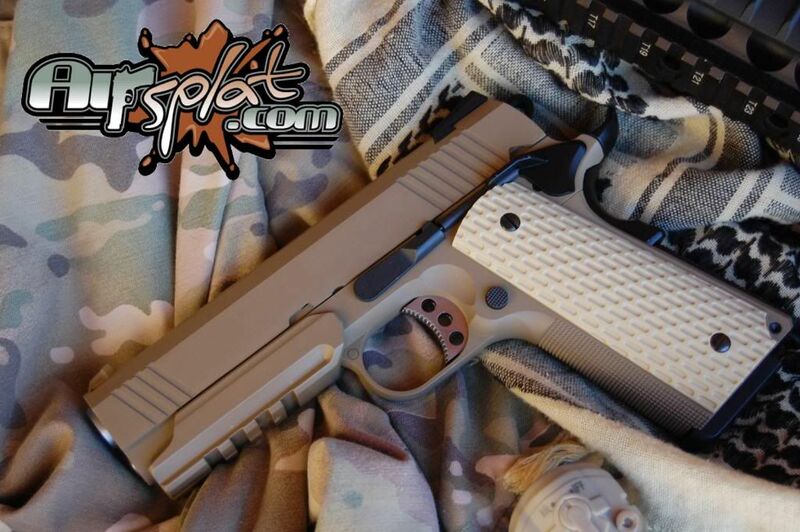 The Desert Warrior is devoid of any trademarks, aside from a single ".45 ACP" marking on the outer barrel. It had a "Made in Taiwan" sticker located on the frame, which I removed for this review. The included magazine is a single stack design which holds 15 rounds. It is compatible with other WE 1911 magazines, so spare mags are plentiful. The bottom of the mag has a metal bumper, which may require an extension for some gas cans to fill it, but I don't have any issues with my AI propane adapters. The gun did exhibit some magazine cooldown, as to be expected with a full metal GBB pistol, however, in a rapid fire test, I was able to get 31 shots off of a single gas fill, showing that it still does have pretty good gas economy. Range and accuracy were pretty much standard for a pistol, giving me torso kills at 90' 85% of the time. It's a sidearm, and it functions well in that regard. A tightbore barrel, or even a longer tightbore ran through a can would give better results. One thing I love about 1911s is the fact that they can be disassembled without any tools, and in a matter of seconds. First, you must remove the magazine, and then pull the slide back to the point indicated below. You can then push out the slide lock lever. With the slide lock removed, you can pull the slide forward and off of the frame. At this point, you can lubricate the essential parts of the gun to keep it running properly. You can further disassemble the slide into its main components by first removing the guide rod and spring. You must pull back on the front of the guide rod assembly, while pushing the actual rod forwards as well. With some practice, it can be done in seconds. You can then push the barrel out the front of the slide and remove it. The blowback assembly is plastic, with a metal piston head, giving it good reliability. Keep this area well lubed, and the gun will run like a top. Some users have reported issues with WE 1911 pistols, including having the hammer get locked inside the slide during firing. I have not encountered this problem personally, however, it is something to look out for. Since it's a 1911, you have plenty of options as far as modification goes, but in all honesty, the gun is almost perfect as is. I'd recommend sanding the bottom of the grips to prevent discomfort, and maybe adding a threaded barrel, but otherwise, I think it's gorgeous. The rail allows you to mount accessories, such as lights and lasers, and it really adds to the look of the gun. Other than that, painting the front sight dot would be a good idea, and would aid in target acquisition. I've always been a fan of WE's pistols, and I currently own four of them, and one GBBR, and I've never had any problems with them. If you keep them clean and lubed, they will run and run and run, and deliver solid performance to boot. This 1911 is no exception, and I'm happy to add it to my collection. It has claimed its first kills on the field already, and I think it will claim many more before I'm done with it.